We hear all the time how The Netherlands is a demonstration of how the New York City and New Jersey metro area can adapt to coastal flooding. But we have very little in common with The Netherlands … they have 28% of their land below average sea level and evacuation distances can be very long. We have 0% below average sea level. We have 0% of our neighborhoods below typical high tide levels (rounded off), for that matter. Most importantly in terms of human vulnerability, as opposed to property concerns, our region has ample high ground for evacuation. Building permanent walls or tide gates like the Dutch have done should be seen as a property-protecting solution only. This approach successfully reduces risk for smaller flood events, leads to temporary safety, additional development in floodplains, and eventually, complacency. However, it also dramatically raises human risks when “surprise” large events go higher than the design height of the barriers (just ask New Orleans). Choosing a design height for barriers becomes especially problematic when sea level rise is accelerating, as we know they are now doing. The Netherlands has one option that we may want to look at more closely, however — the humble polder. A Polder is a large walled-in tract of land where water (and groundwater) is pumped out to a lower level than surrounding areas. These areas then can accept flood waters from surrounding urban areas, as a last resort during a storm surge. This hasn’t been examined in the New York City metropolitan area because we lack large, non-pristine open areas like the Dutch farmland … or do we? Hoboken and its nearby neighbor to the west, the Penhorn Creek watershed, across the Palisades (The Heights). The area is bordered on the north by highway 495, west by highway 95, south by County Road and east by highway 1/9. Hoboken is a square-mile city with a population of 50,000 along the Hudson River with about 50% of its property inside the new (draft) FEMA 100-year flood zones. Our mayor recently proposed using a combination of retractable and permanent walls to block out flood waters. She also smartly proposed many additional redundant steps to improve resilience, such as elevating living quarters above base flood elevations. 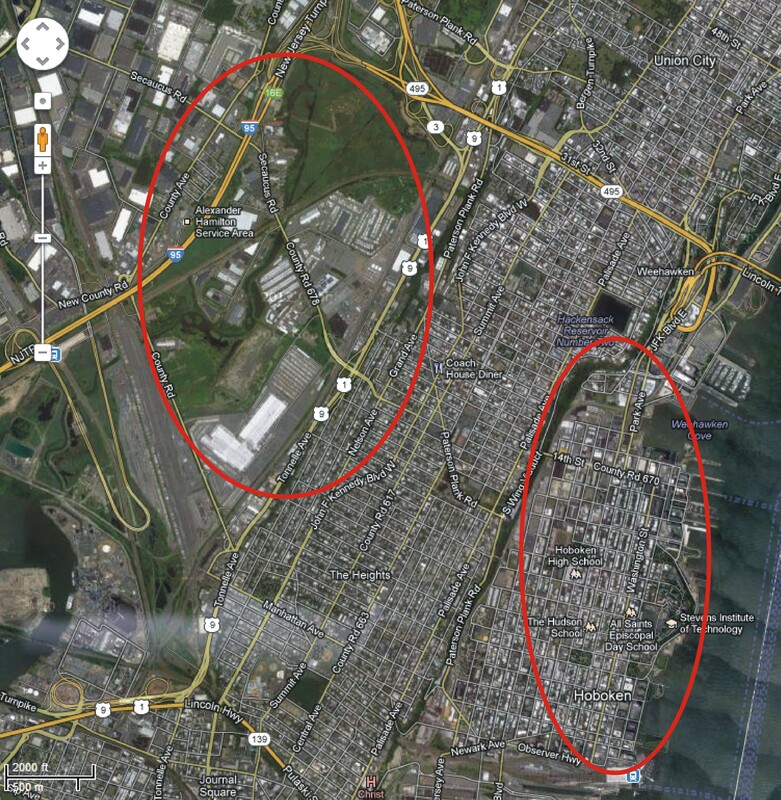 If you look closely at a map of Hoboken, there is a heavily impacted region just over the bluff, just over one mile away — The Meadowlands. In particular, the Penhorn Creek area shown above currently has about 50% areal coverage of parking lots, and is most certainly not a pristine wild area. What if towns like Hoboken and Jersey City bought up the properties and converted the area to a polder system, with environmental improvements to create something with more ecological value and far more societal value than what exists today? A standard polder protocol would apply — Pumps would lower the average water level in the area, and walls could keep out the tides. A system like this can be modified and the parking lots removed to simulate a seasonally-flooded habitat instead of a tidal habitat, as long as the “low water season” coincides with storm surge season so it is a useful “escape hatch” for flood waters. In the event of a 500-year flood that overtops all other protections, gated tunnels at the back of Hoboken could be opened and lead floodwaters away and gently down-slope into the polder. I’m not sure I would vote for the idea, but it’s worth putting out there. Cities like Hoboken are our most sustainable communities in many ways because of their urban density. However, with increasing threats from sea level rise and storm surges, solutions for such a low-lying city with very little high ground are hard to come by. It’s worth exploring any way to protect the city’s property. The new FEMA advisory flood maps have 100-year base flood elevations of 14-16 feet, which is ~10 feet above the lower waterfront walls in some parts of town. The 500-year base flood elevations are 4-5 feet higher … do we want 10 or even 15 foot high walls at the front of Hoboken? The polder idea may enable us to simply plan for the 100-year flood, use retractable 5-8 foot walls on the waterfront and 10-15 foot high walls at the lowest points on the sides of town, and give us a back-up solution if the flood waters rise higher. This entry was posted in opinion, security, water and tagged barrier, deployable, flood, Hoboken, Jersey City, Meadowlands, Netherlands, new jersey, Penhorn Creek, polder, protection, refuge, retractable, sea level rise, storm surge, walls, wildlife. Bookmark the permalink. Great write up. Don’t you mean the Penhorn Creek? 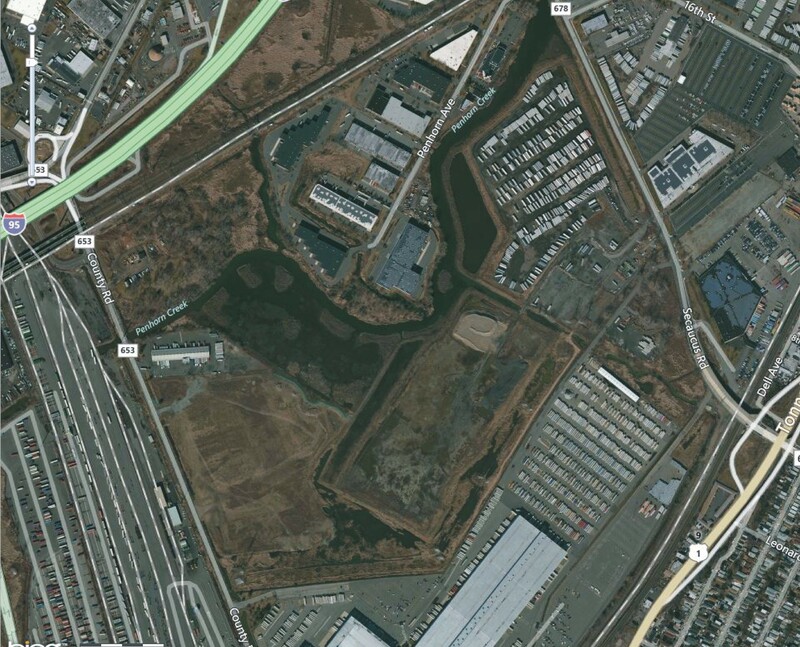 If so, the Penhorn Creek area has bad flooding already, especially along Secaucus Road near Penhorn Road. The pump station there can barely handle the flood waters. You’re right – I corrected it to be Penhorn (was Peahorn – my error!). If it is converted to a polder, then water will be pumped out to a lower normal level, so it will be less likely to flood anyone. Seacaucus and Hoboken could join together in purchasing the property in the coming decades, and eventually converting it to a polder system to absorb floodwaters from both cities. “Rules” for when to stop filling it with flood waters (close the tunnel / pipe gates) would have to be determined so that the system cannot overflow.